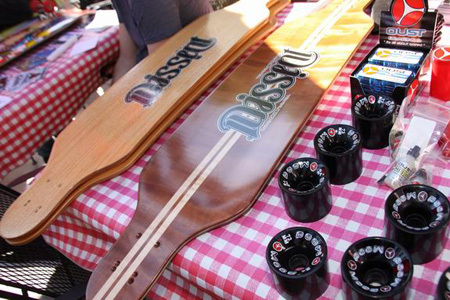 DISSENT LONGBOARDS are manufactured by OUST Composites starting with a blend of USA made High Performance Aerospace Carbon fiber, high tensile strength Epoxy resins, and a high strength super flexible prepreg inner core. The outer skins are AAAAA musical grade Exotic figured woods, and an array of other exotic African, Brazilian, and USA grown woods. Oust Bearings are the best bearings I've ridden. They're fast, smooth and don't break. Now I can skate without having to replace broken bearings everyday, thanks to Oust. It's great to be part of a team.